It is now time to talk about the Irish Leonardo da Vinci; Seamus O'Kane. He really the most curious and active person I have ever had the pleasure to know, not only is he known everywhere for his excellent bodhráns but works so well on the fiddle and harp. In addition to researching and reproducing the Downhill harp, like the one I photographed above, Seamus is also making smaller wire-strung harps (22 strings) which have a great sound and can be easily carried around. To place an order, here are the contact details: www.tradcentre.com /seamus. 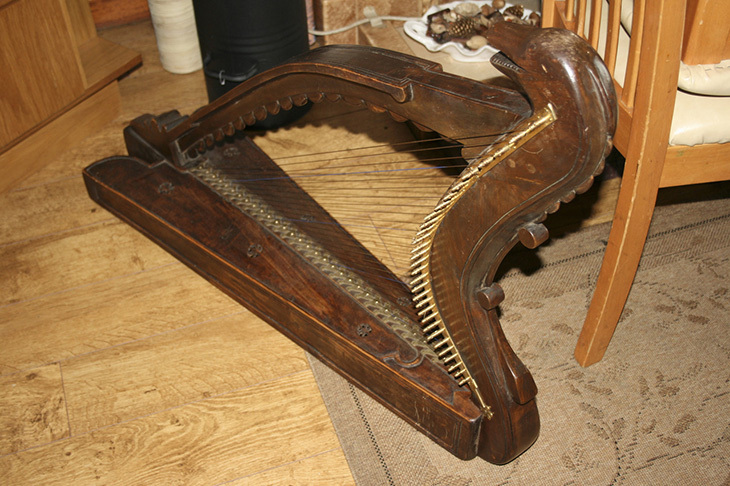 Below you will find links to the full version of the documentary Banríon an Cheoil on the reconstruction of the harp Downhill harp played by Hempson at the Belfast Harp Festival , downloadable here from my dropbox. In addition to seeing Seamus carving wood as if it were butter, there are a lot of interesting ideas from the musical point of view.